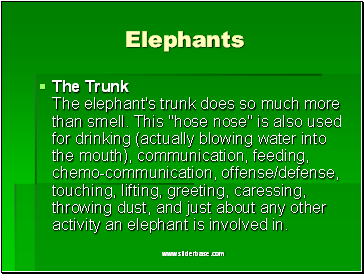 The Trunk The elephant's trunk does so much more than smell. 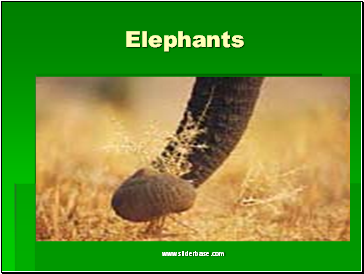 This "hose nose" is also used for drinking (actually blowing water into the mouth), communication, feeding, chemo-communication, offense/defense, touching, lifting, greeting, caressing, throwing dust, and just about any other activity an elephant is involved in. 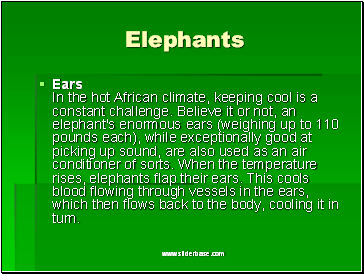 Ears In the hot African climate, keeping cool is a constant challenge. 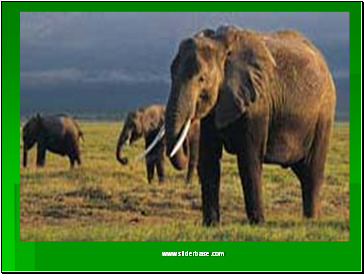 Believe it or not, an elephant's enormous ears (weighing up to 110 pounds each), while exceptionally good at picking up sound, are also used as an air conditioner of sorts. 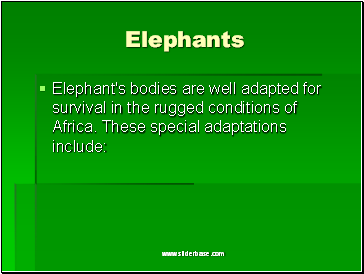 When the temperature rises, elephants flap their ears. 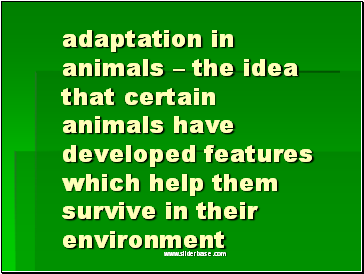 This cools blood flowing through vessels in the ears, which then flows back to the body, cooling it in turn. 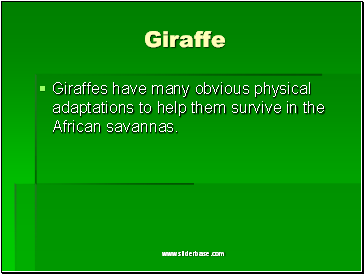 Giraffes have many obvious physical adaptations to help them survive in the African savannas. 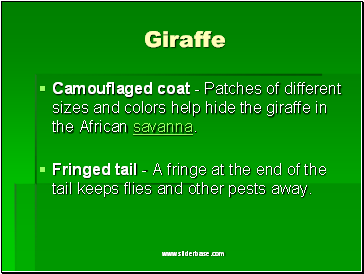 Camouflaged coat - Patches of different sizes and colors help hide the giraffe in the African savanna. Fringed tail - A fringe at the end of the tail keeps flies and other pests away. 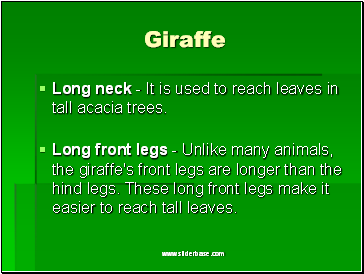 Long neck - It is used to reach leaves in tall acacia trees. 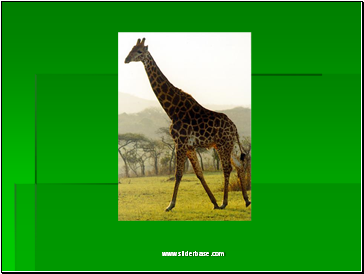 Long front legs - Unlike many animals, the giraffe's front legs are longer than the hind legs. These long front legs make it easier to reach tall leaves. 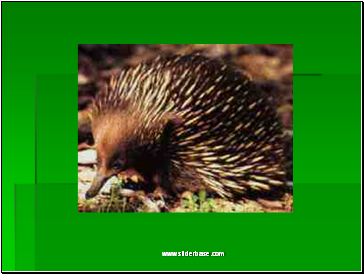 An Echidna is a mammal and is also known as the Spiny Anteater. 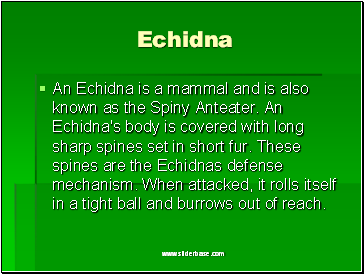 An Echidna's body is covered with long sharp spines set in short fur. These spines are the Echidnas defense mechanism. When attacked, it rolls itself in a tight ball and burrows out of reach.